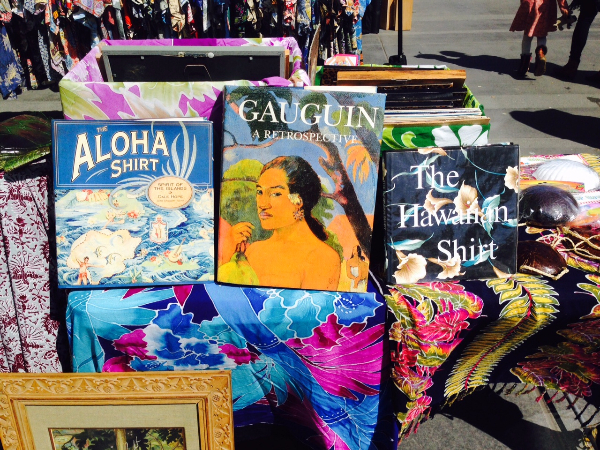 The Treasure Island Flea is inviting you to get into the island spirit this weekend with Hawaiian goods, happy hour specials, food & shaved ice, leis, kids’ activities, & much more! More info below. The Treasure Island Flea boasts ~400 vendors selling everything from antiques/vintage apparel to furniture, art, new fashion apparel and more! There’s also the Makers’ Square features a rotating selection of DIY workshops, and live music from local bands on the great lawn. Plus, a kid zone filled with activities from jump houses to petting zoos, pony rides, magic and more! First 500 each day get lei’d! First 500 each day get a complimentary lei to jumpstart your Hawaii-July experience! Happy Hour 10AM-Noon! After you’ve received free lei, head over to the TI Flea Tiki Bar for 2 for 1 rum punch Mai-Tai specials! 2 for 1 happy hour ends at noon, but we’ll be serving up mimosas, bloody marys, rum cocktails and craft beers and wines all day long! Hawaiian Shaved Ice! This weekend is shaping up to be a hot one and we’ve got just the thing to help you keep your cool: Hawaiian shaved ice from Sugar and Ice. Kids and adults can have fun custom making their own creations. They give you the ice and you load up on the flavors yourself! Hula Hoopin’! Get your Hula on with Bay Area Hoopers! Each day there will be Hulas to try and a professional teacher to show you the way. In addition there will be other kids games like giant sumo wrestling and a nerf gun obstacle course! MmmMMm Donuts! Because Hawaii Not? The Treasure Island Flea is the largest monthly gathering of food trucks in the Bay Area and this month we are welcoming in the very popular Johnny Donuts! Johnny’s Donuts are famous for their creative flavors, mouth-melting textures and overall freshness and we are excited to feature them in our mix of other top rated trucks and tents from around the bay! This entry was posted in All Ages, Art, Events, Family Friendly, Festivals, Food & Drink, Music, Pictures and tagged 2015 san francisco july events, 2015 san francisco summer markets, 2015 san francisco waterfront flicks, 2015 treasure island flea, 2015 treasure island flea events, free jack london square events, free san francisco all ages events, free san francisco art events, free san francisco family friendly events, free san francisco festivals, free san francisco july events, free san francisco movies, free san francisco music events, free san francisco summer movies, hawaii-july treasure island flea, jack london square events, jack london square july events, san francisco all ages events, San Francisco Art Events, san francisco bike events, san francisco dance events, san francisco events, san francisco family friendly events, san francisco festivals, san francisco flea markets, san francisco july events, san francisco markets, san francisco movie events, san francisco outdoor summer concerts, san francisco outdoor summer movies, san francisco shopping events, san francisco summer events, san francisco summer markets, san francisco treasure island flea, san francisco waterfront flicks, Treasure Island Flea, treasure island flea july.